Showcasing 10 of the world’s best restaurants with amazing views. 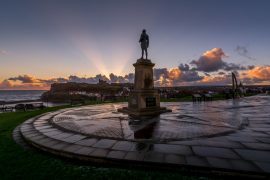 Whether the food is good or bad, it doesn’t really matter as there’s always the view! 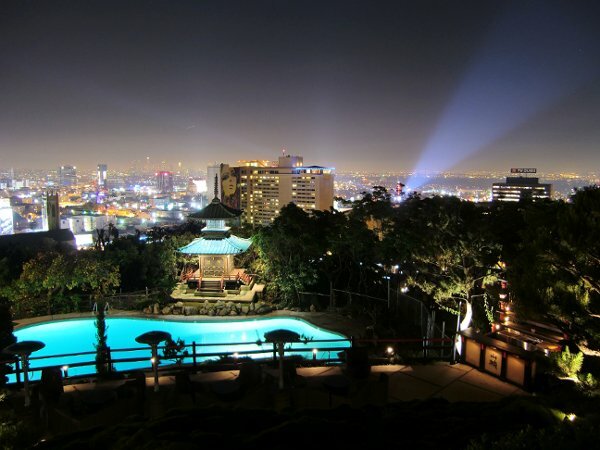 Located in the Hollywood Hills, this upscale Asian restaurant offers an unimaginable view of the brilliant Los Angeles skyline. Go on a clear night and you can see lights for miles. The centre of the restaurant houses a Japanese garden teaming with gushing fountains and colourful fish. The ”CalAsian” cuisine is tasty but light and the cocktails are refreshing. The restaurant itself looks like a authentic Japanese castle or home and the whole vibe in it itself is really entertaining. 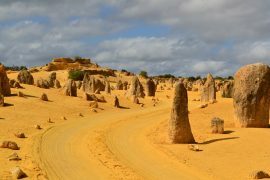 We would definitely recommend this place especially if you have a significant other and what to spice up your relationship with something new and romantic! 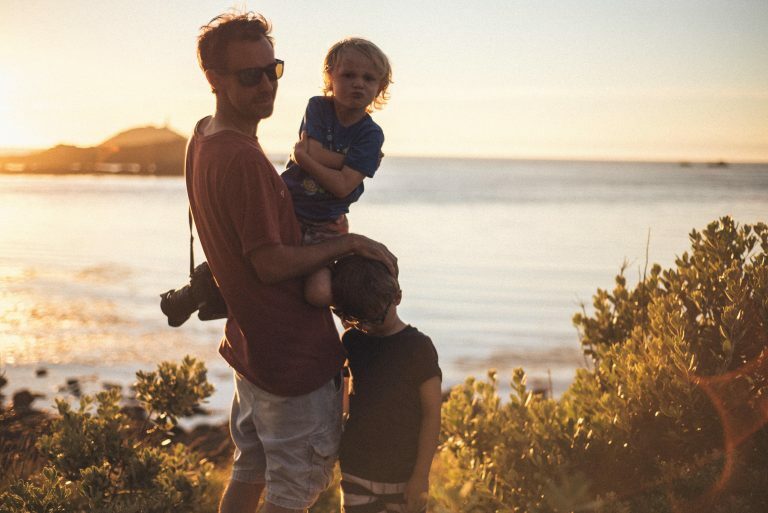 The Grand Canyon attracts flocks of visitors to the spectacular South Rim, take lots of photographs, have a short walk admiring the awe inspiring views and then depart. 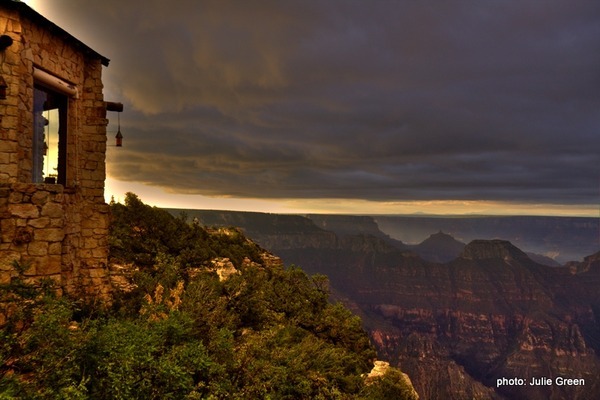 But it’s the guests of Grand Canyon Lodge who experience the Grand Canyon real character – wild, lonely, and unpredictable. Watch the day go by from the sun terrace and dine with the view of the world’s greatest natural miracle. The timber-smelling, rustic restaurant may not be hitting the height of gastronomy, but who cares about food when there’s such a spectacle going on outside. The menu features quite a lot of choices, including regional as well as 1930’s themed foods. 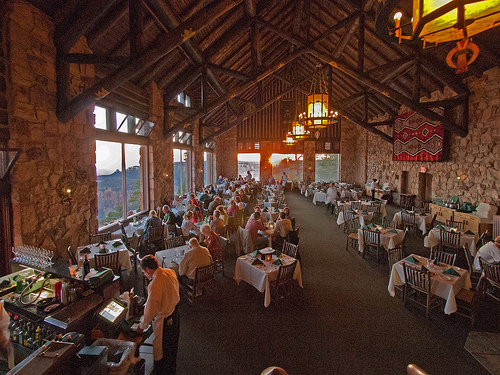 The dining room is very spacious, but compared to the grandness of the Canyon, it feels really warm and cozy. 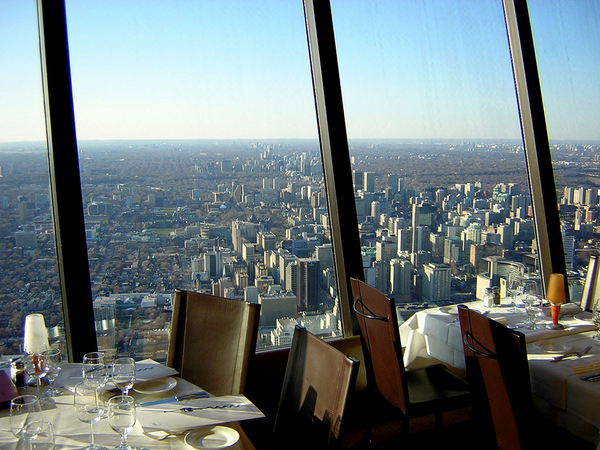 At Toronto’s 360 Restaurant, dining is brought to a whole different level. 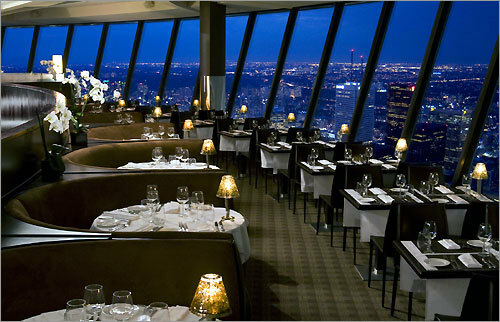 Firstly, because the restaurant sits 351 meters (1151 ft) above ground on top of the CN Tower. Secondly, because it slowly revolves to give you 360 degree views of the magnificent city. After major remodelling in 1995, the restaurant is no longer just a tourist magnet but a truly sophisticated dining experience. 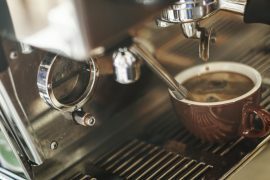 Some say the menu has left them with taste buds unsatisfied and wallets emptied. But even if you’re not satisfied with food, the bill pays for the ticket to the observation deck without queuing. 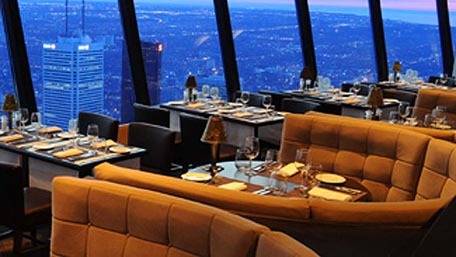 Just pick a cloudless evening and take in the splendor of Toronto from up high, preferably having a glass of wine from the restaurant’s award-winning “cellar in the sky”. 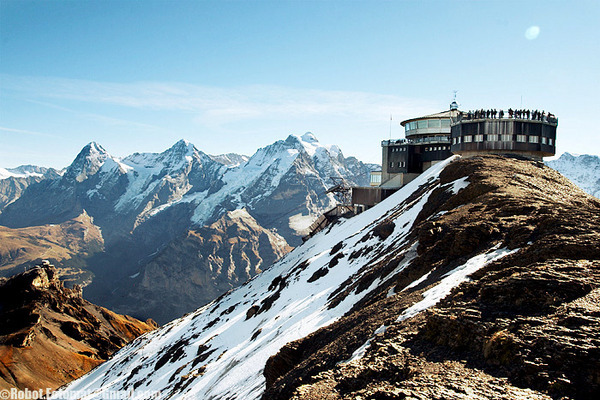 Perched on top of 2,970 m (9,744 ft) Schilthorn, in the Swiss Alps, Piz Gloria was a prominent location for the 1969 film ‘On Her Majesty’s Secret Service’ of the famous James Bond series. 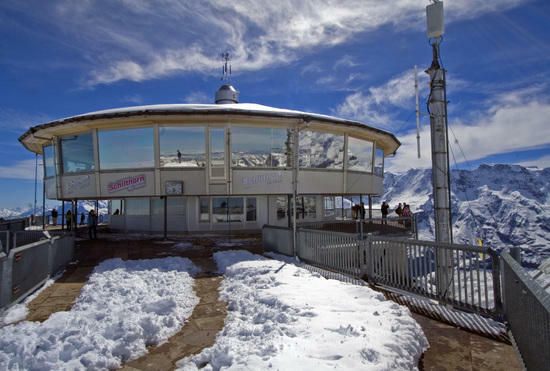 Since then, both the restaurant and the funicular have undergone a major facelift and draw countless visitors willing to get 360-degree views of the dramatic alpine spectacle over a bowl of steamy chicken soup. The dining area can accommodate 400 patrons and takes about an hour to completely rotate. 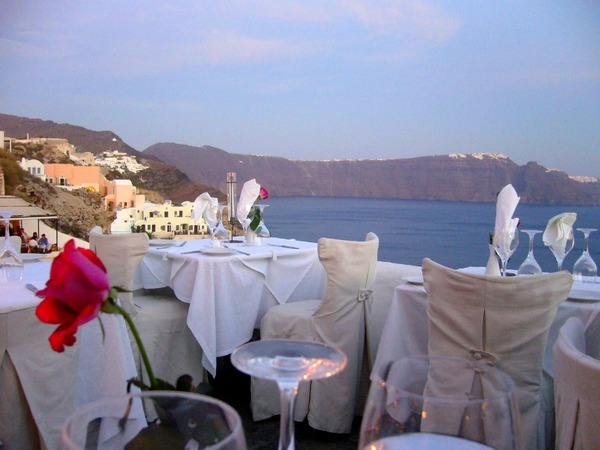 Santorini is by far one of the most romantic places in Europe, so it’s not really difficult to set up a business that makes it to the ‘World’s Most Scenic Restaurants’ list. Ambrosia is definitely one that deserves the title, and it’s not only thanks to its cozy atmosphere, unique decor, and fantasy-like views of the volcanic sea caldera. 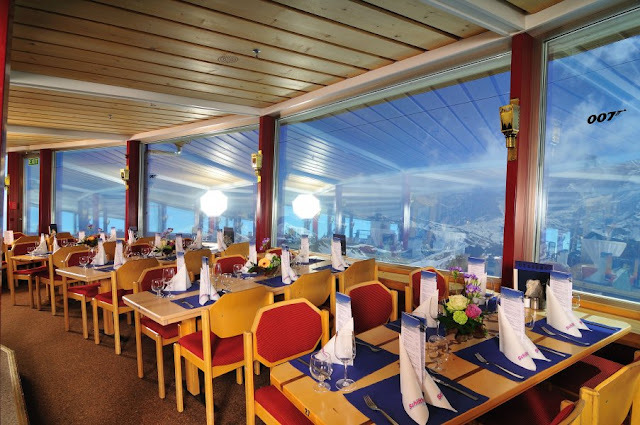 The food and service are said to be excellent, so you don’t have to compromise on quality for the sake of beautiful surroundings. Candlelight, rose petals, stars above your head and food that’s really tasty – can you really ask for more? The only way to get there is to hire a boat and you can have a swim while waiting for your seafood to be served. 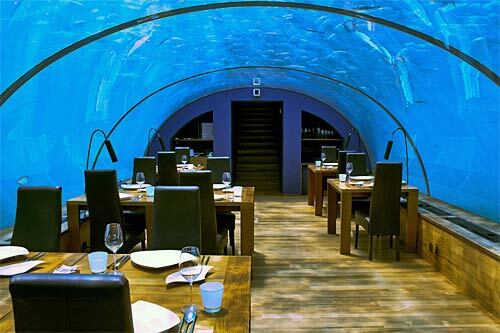 Can you imagine a more unusual restaurant? 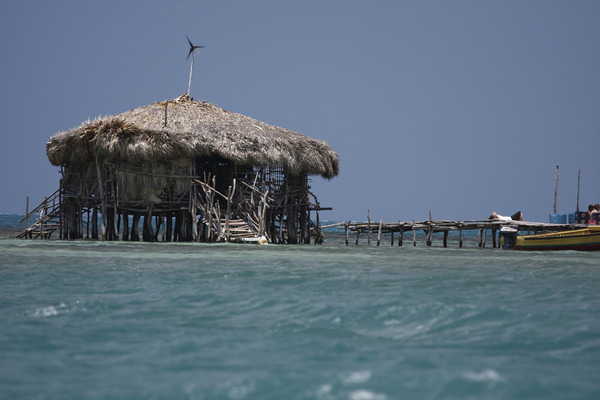 Situated a mile from the shore, the bamboo construction rises out of the infinite blue and looks as if it was just about to be blown by the wind. Floyd’s is almost a legend and once you have a cold one here, you’ll want to come back over and over again. A 6-hour trip for two, including private transportation, boat to Floyd’s and lunch, is around $180. Red Sea Star is a place like no other on the planet. 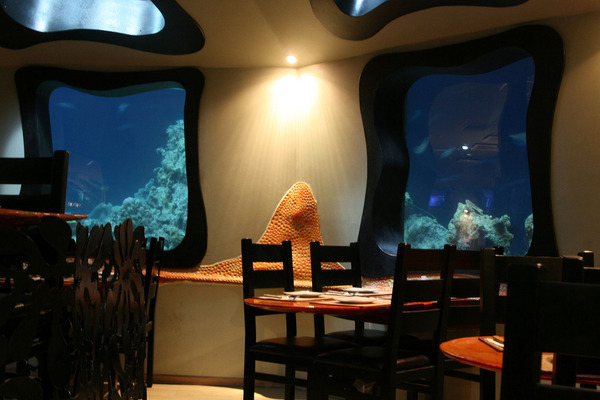 This first and only underwater restaurant looks like a beautiful coral garden itself, and there’s still the better part outside. 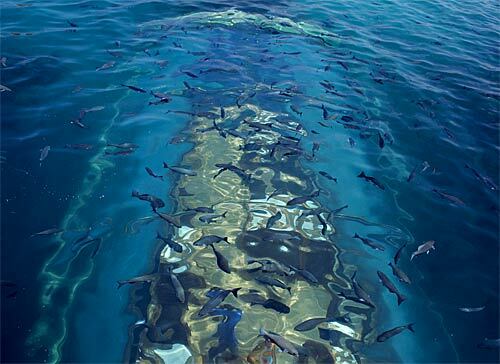 5m (16 ft) below the surface of the Red Sea, you can enjoy you meal while watching unbelievably colorful creatures swim by right next to the window. The food is said to be average, but the experience unbeatable. Soft light comes in to illuminate the unique décor, and you’ll really find yourself in two minds whether to focus on the interior or gaze outside. Cabo San Lucas is a dreamlike destination and the premises of Sunset da Mona Lisa expose its beauty in a way that’s hard to forget. Multileveled terraces hang above crystal-clear pools, giving you a sense of floating on water. The Italian chef makes sure the dishes are genuine and range from the simplest to most sophisticated specialties of Italian cuisine. 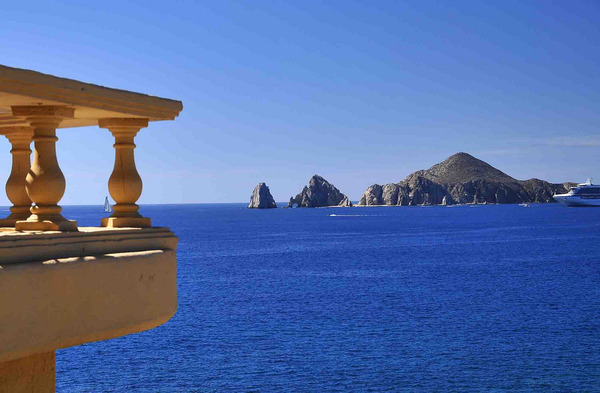 Wash them down with the best of Italian wines and watch the sun disappear in the waters of Cabo San Lucas Bay. Pure magic. 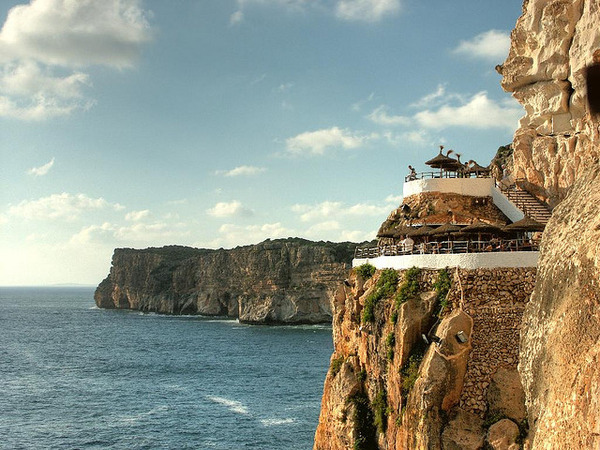 Carved in the cliff on the south coast of Menorca, with multileveled terraces spanning on rock shelves, the Cove d’en Xoroi is a bar, a restaurant, and a nightclub in one. 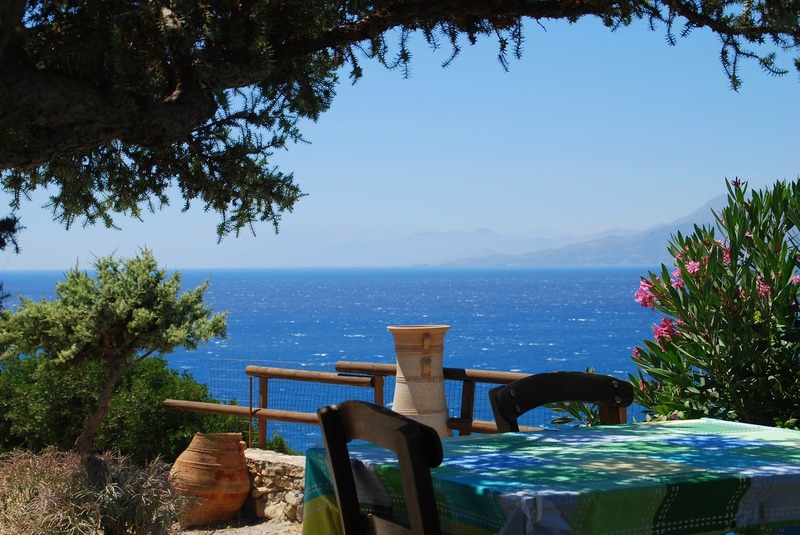 Enjoy a morning coffee with the heavenly beach and cove of Cala ‘n Porter in front of your eyes, hide from the heat in the legendary grotto and dine watching the sun roll down beyond the horizon. And when the stars are up, there’s no better place to get the taste of nightlife in Menorca. 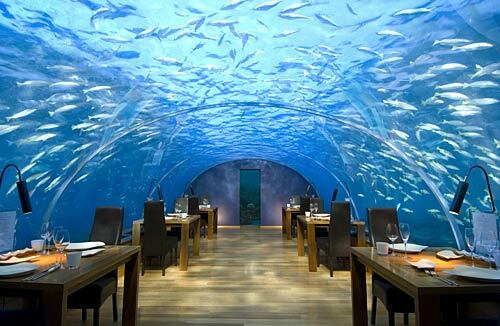 Ithaa Undersea restaurant sits 16 feet below sea level at the Conrad Maldives Rangali Island, a hotel resort in Hilton’s luxury brand that occupies two islands. Maldives is a country of almost 1,200 islands about 300 miles from the southernmost points of India and Sri Lanka. This stunning restaurant is open for lunch and dinner daily from 11 a.m. to midnight, according to the resort’s website.